Long Term investment – 5 year warranty as standard. Future proofing the hospitals investment in EMR funding. Environmental Sustainability – less waste. The GCX Cart will outlive the product that is being mounted, and can then be utilised for new PC’s in the future. Instead of adding to land fill every two years with new carts. 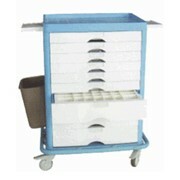 Modularity – GCX Carts use the Channel system that is also used on walls via wall Channel Systems. 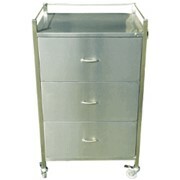 When new technology comes in, further products can be added, or removed from the cart, eliminating the need to purchase a whole new cart. 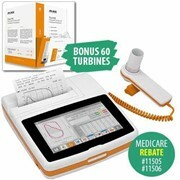 Incorporating EMR on to existing GCX Channels that are being used for Patient Monitors in various areas of the hospital. 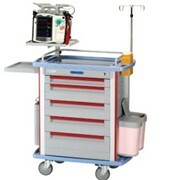 Also EMR PC’s can be added to existing Anaesthetic machines within OR’s. 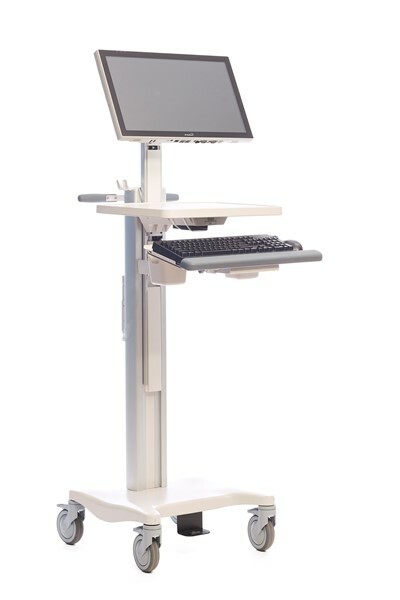 GCX’s mounting solutions are ergonomically adjustable and designed to accommodate a broad range of users. Sit and stand capabilities provide user flexibility for seamless device interaction. Just as important, our expertise with mounting solutions enables us to thoroughly consider the workflow implications and to help drive best practices throughout your facility. GCX has been manufacturing medical mounting devices for 45 years in the US. GCX is ISO 13485:2003 accredited, use all medical grade materials that can be cleaned using nonabrasive solutions such as diluted bleach, ammonia or alcohol based solutions, is robust and safe. 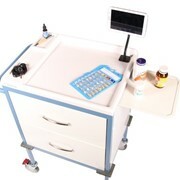 HPA have developed a new Workstation on Wheels incorporating an All In One PC with Hot Swappable Batteries. 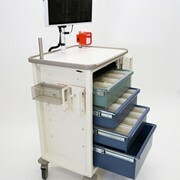 This Cart eliminates the need for a Laptop and hence a laptop enclosure and battery backup system – making the HPA AIO Cart more cost effective, and a longer term solution for your facility. Small footprint, with height adjustment. Modular & futureproof: wall mounted, ceiling mounted, countertop and mobile solutions. Easily Interchangeable and swappable components to change with workflow needs and practices. 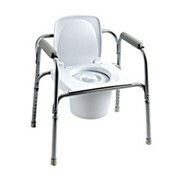 Secure and ergonomic access to devices. Quality materials and medical grade to allow digital health records at the point of care. ISO 13485:2003 Certified – international standard defining the requirements of a quality management system for the design, manufacture and distribution of medical devices.